If you have any questions about the VAJOLIROJA information page below please contact us. 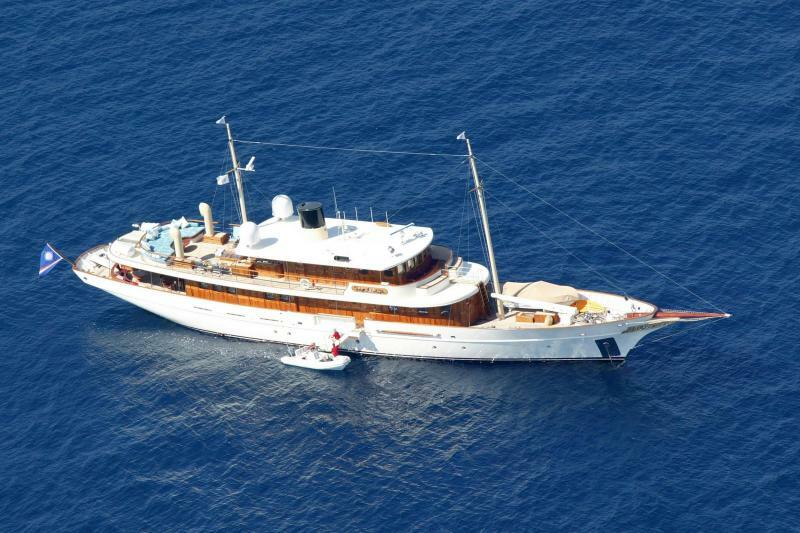 This motor yacht VAJOLIROJA is a superyacht of ample proportions. 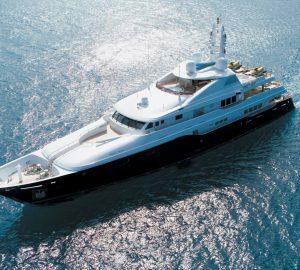 This 48 m (156 foot) luxury yacht was proudly created at Proteksan Turquoise Yachts in 2001. VAJOLIROJA used to be the project or yacht name Anatolia. Superyacht VAJOLIROJA is a well designed yacht that can sleep as many as 10 people on board and has a total of 7 crew. The firm of naval architecture responsible for this yacht's design work for this ship was Tanju Kalaycioglu. Redman Whiteley Design Of London was the designer which over saw this boat's interior styling. She is a magnificent 'modern classic' traditional styled motor yacht with tasteful styling which creates a wonderful authentic marine atmosphere. This motor yacht was also refitted and upgraded in 2009. The yacht's general design work came from Tanju Kalaycioglu. The technical naval architect firm intellectual property are the products of Tanju Kalaycioglu. Motor Yacht VAJOLIROJA received her elegant interior designing from the interior design office of Redman Whiteley Design Of London. In 2001 she was formally launched to triumph in Istanbul and post sea trials and detailing was thereafter passed on to the owner who commissioned her. Proteksan Turquoise Yachts completed their new build motor yacht in Turkey. A reasonable proportion is manifested with a maximum beam (width) of 7 metres / 23 feet. With a 2.38m (7.8ft) draught (maximum depth) she is shallow. The material steel was used in the building of the hull of the motor yacht. Her superstructure over the hull is created out of aluminiumandgrpandteak. Over the deck of VAJOLIROJA she is 43.6 (143 ft) in length. In 2007 extra refit work and modernisation was additionally finished. The motor yacht is engineered with twin CATERPILLAR diesel engine(s) and can accelerate to a impressive top end continuous speed at 14 knots. The engine of the ship generates 480 horse power (or 353 kilowatts). Her total HP is 960 HP and her total Kilowatts are 706. For propulsion VAJOLIROJA has twin screw propellers. With respect to the ship’s stabalisers she was built with Naiad. Regarding bow thruster maneuverability she was fitted with Cramm. Her industrious cruise speed is 12 knots which makes a range of 3000. Bestowing cabins for a maximum of 10 welcome guests staying on board, the VAJOLIROJA accommodates everyone comfortably. This ship utilises approximately 7 proficient crew members to maintain and sail. 47.55 metres / 156 feet. Total engine power output 960 HP /706 KW. Approximate Cruise Speed is 12 nautical miles per hour. Her top Speed is around 14 knots. 3000 at a speed of 11 knots. Caterpillar 2 times 50 kilowatts; Northern Lights 1 times 16 kilowatts. The luxury yacht VAJOLIROJA displayed on this page is merely informational and she is not necessarily available for yacht charter or for sale, nor is she represented or marketed in anyway by CharterWorld. This web page and the superyacht information contained herein is not contractual. All yacht specifications and informations are displayed in good faith but CharterWorld does not warrant or assume any legal liability or responsibility for the current accuracy, completeness, validity, or usefulness of any superyacht information and/or images displayed. All boat information is subject to change without prior notice and may not be current.